Digitising film archive with specialist photo mutiplier drum scanners records the most accurate film detail. compromised because this fact has not properly understood. demanding users as being the very best method of digitising film. nothing less than the very best drum scans should be your aim..
Real drum scans only come from scanners that use photo multiplier tube technology. Their very many advantages include being able to record the film's information considerably more accurately than any CCD scanner is capable of. So called 'Virtual drum scanners' are simply CCD scanners with a 'misleading' marketing name. In the picture opposite a drum loaded with film is being placed into one of our two Heidelberg PrimeScan high resolution drum scanners in the clean loading room. 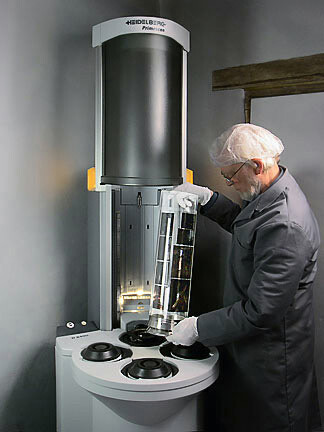 These $70,000 drum scanners are state of the art and allow us to produce scans of superlative quality from film and flat artwork of up to A2plus in size. If you are interested in learning more about scanning, the next page provides additional insights into this important subject. Please ring us to discuss how we can help with your film archive.